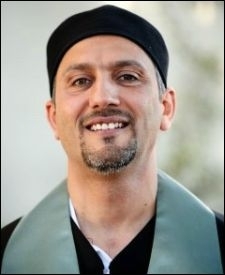 A member of a Berkeley, California city commission ostensibly devoted to the "social welfare needs" of "low-income residents," who was dismissed after introducing a boycott, divestment, and sanctions (BDS) resolution has found a champion in UC Berkeley Department of Near Eastern studies (NES) lecturer Hatem Bazian. Bazian provided the introduction to a September 18 lecture co-sponsored by NES and delivered by Omar Barghouti, co-founder of the Palestinian Campaign for the Academic and Cultural Boycott of Israel (PACBI). An audience of approximately two hundred, comprised mostly of students and including local anti-Israel activists, twenty or so women in hijabs, and a tall man with a "Palestine" sash around his neck who, during the Q&A, claimed to work for the virulently anti-Israel online magazine Electronic Intifada, filled a large lecture hall in UC Berkeley's Dwinelle Hall. Before introducing Barghouti, Bazian rallied the audience to the "cause" of Cheryl Davila, the former Human Welfare & Community Action Commission (HWCAC) member. Davila was removed from her post at the outset of HWCAC's September meeting by City Councilman Darryl Moore, who appointed her in 2009, because she refused to withdraw the "Divestment From the Israeli Occupation" resolution (see page 70) she sponsored. Moore alleged that Davila neglected to notify him about the controversial proposal and claimed it was a misuse of the commission. HWCAC will revise and vote on the resolution in October and if passed, it will proceed to the Berkeley City Council for a vote. The council has rejected two previous Israel divestment measures. [T]his is the type of democracy you face when you deal with Palestine. I will say that you [the commission] have a progressive agenda except when it comes to Palestine. Seventy-seven percent of the American public was against Martin Luther King. . . . Most of the newspapers nationally were against Martin Luther King because he opposed the Vietnam War. Therefore, today, you have the Martin Luther King building here; you have the street . . . in downtown Berkeley. We have many streets and many schools across the country. MLK was right. And, Cheryl, in your resolution, you were right and history will prove you right. Hatem Bazian founded the radical anti-Israel group Students for Justice in Palestine. Bazian, director of UC Berkeley's Islamophobia Research & Documentation Project, is accustomed to melodramatic claims of victimhood, evidence to the contrary notwithstanding. He is also the founder of the radical anti-Israel group Students for Justice in Palestine (SJP), a point of pride driven home by his admonishment to reporters in attendance: "At least historically be accurate: SJP was created on this campus in 1992." The fact that SJP—which, along with Bazian's other creation, American Muslims for Palestine (AMP), co-sponsored Barghouti's lecture—endorsed Davila's divestment resolution further demonstrates his bias. A proponent of the BDS movement, Bazian urged audience members to "sign the mailing list" for the U.S. Campaign for the Academic and Cultural Boycott of Israel (USACBI), another co-sponsor of the lecture that counts a good number of Middle East studies academics among its organizers and endorsers. Engaging in predictably spurious comparisons between Israel and apartheid-era South Africa, Bazian disdained any move, then or now, towards "constructive engagement." Barghouti followed by explaining "Why it's so important for academics in the country to support the academic boycott." As a movement that, he maintained, "rejects all forms of discrimination, including anti-Semitism," BDS is something "any decent liberal" should support. If one were to judge by Barghouti's delivery alone, which was calm, measured, and, at times, humorous, singling out the world's lone Jewish state for economic boycott—which he excused by citing "U.S. support" as the deciding factor—would appear entirely reasonable. Why boycott academia, "the most progressive sector of any society?" Barghouti asked rhetorically. His answer cited Israeli academe's complicity in "branding" the country as what it, in fact, truly is: a liberal democracy with gay and women's rights. He then accused Israeli universities of being "entrenched in their role of planning, implementing, justifying, and whitewashing Israel's regime of oppression." He claimed that BDS "targets institutions, not individuals"; thus, it's acceptable for "an Israeli professor" to be "invited to teach at Berkeley," given that there is no "agreement with an Israeli university" or any "institutional links." Barghouti asserted that such a boycott constitutes a mere loss of "privileges," not a "threat to academic freedom." The event, devoted entirely to cheerleading for BDS, was co-sponsored by UC Berkeley's Department of Near Eastern studies. Of PACBI's role in the American BDS movement, Barghouti bragged that "spreading the academic boycott to U.S. academic associations" has been its primary achievement. The significance of the Modern Language Association, the American Studies Association, and others considering BDS resolutions is that the "taboo" of discussing "Israel and boycott in the same sentence" has been "shattered." Today, he concluded ominously, "It's not beyond the pale." For around twenty minutes during Barghouti's lecture, a small group of student protesters stood silently in the front of the room with signs reading, "Banning the Ideas of One Nation Is Discrimination" and "UC Berkeley Academic Departments Support Limiting Academia." Neither Barghouti nor the audience acknowledged their presence and it was a far cry from the disruptive protests, heckling, and violence that has met pro-Israel speakers on campus. 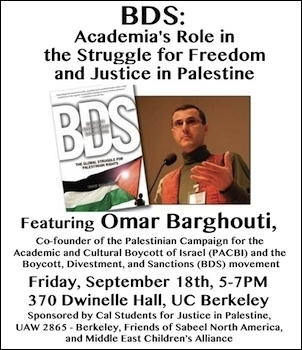 It's difficult to say which was more egregious: Bazian's encouragement of the city of Berkeley to boycott Israel, Barghouti's coolly delivered apologia for bigotry, or the fact that an event devoted entirely to cheerleading for BDS was co-sponsored by UC Berkeley's Department of Near Eastern studies. It is a testament to the state of the field that contempt for the truth and the embrace of agitprop and indoctrination over rigorous, objective scholarship is, to paraphrase one of the speakers, no longer beyond the pale.